BIG SALE!! CITRINE BALLS & SPHERES BIG SALE!! 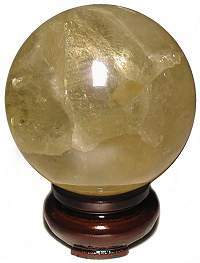 Rare Brazil 58mm Citrine Quartz sphere has an exquisite light yellow color, is 75% or more clear with minor veils and rainbow inclusions that give character and beauty to this lovely sphere. Citrine quartz cannot hold negative energy, but transmutes and dissipates it. Citrine is the stone of the entrepreneur, placing a crystal in one's store or office increases good fortune and assists in acquiring and maintaining wealth. Excellent polish and finish. The Oriental Rosewood Stand is sold separately. 58mm or 2 1/3" Sphere - 10ozs. 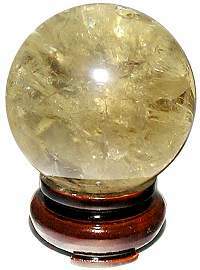 Superb Brazil 60mm AA grade Citrine Quartz sphere has a delicate pale yellow color, is 90% or more clear with very interesting rainbow inclusions that give character and beauty to this lovely sphere. Citrine is the stone of the entrepreneur, placing a crystal in one's store or office increases good fortune and assists in acquiring and maintaining wealth. Excellent polish and finish. The Oriental Rosewood Stand is sold separately. This lovely Brazil 64mm Citrine Quartz sphere has a warm yellow color with some clarity, lots of rainbow inclusions and filmy veils that give this sphere interest and character. Citrine quartz cannot hold negative energy, but transmutes and dissipates it. Citrine is the stone of the entrepreneur, placing a crystal in one's store or office increases good fortune and assists in acquiring and maintaining wealth. Excellent polish and finish. This sphere is shown best on a Lighted Wood Stand that is sold separately. 64mm or 2 5/8" Sphere - 12 1/2ozs. 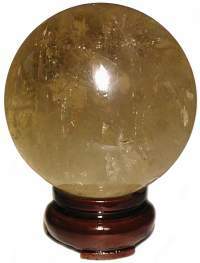 A very interesting Brazil 66mm Citrine Quartz sphere has an exquisite yellow color, is 75% or more clear with a beautiful formation of crystal growth that can be viewed like a kaleidoscope between the extra clear segments of this sphere. Citrine is the stone of the entrepreneur, placing a crystal in one's store or office increases good fortune and assists in acquiring and maintaining wealth. Excellent polish and finish. This sphere is shown best on a Lighted Wood Stand that is sold separately. 66mm or 2 5/8" Sphere - 15ozs. This lovely Brazil 68mm Citrine Quartz sphere has a rich yellow color, is 65% or more clear with a beautiful mix of light veils layered between rainbow inclusions that can be seen through the widely scattered clear segments of this sphere. Citrine is the stone of the entrepreneur, placing a crystal in one's store or office increases good fortune and assists in acquiring and maintaining wealth. Excellent polish and finish. 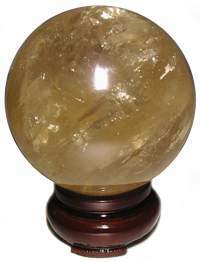 This sphere is shown best on a Lighted Wood Stand that is sold separately. 68mm or 2 3/4" Sphere - 1lb. 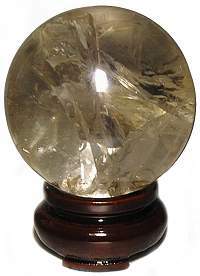 Brazil 72mm Citrine Quartz sphere has an even yellow color, is 65% or more clear with a universe of webbed veils and rainbow inclusions floating within the clear quartz segments that create beauty and interest. Citrine quartz cannot hold negative energy, but transmutes and dissipates it. Excellent polish and finish. 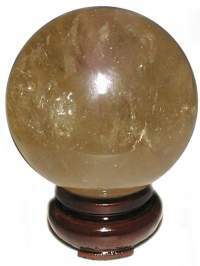 This sphere is shown best on a Lighted Wood Stand that is sold separately. 72mm or 2 7/8" Sphere - 1lbs 4ozs.